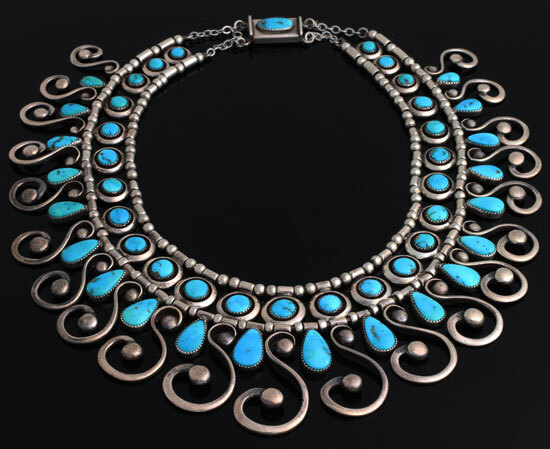 A demi-parure in sterling silver and turquoise by Frank Patania, Sr., circa 1950s. A Coral Curls necklace designed by Frank Sr., circa 1950s. 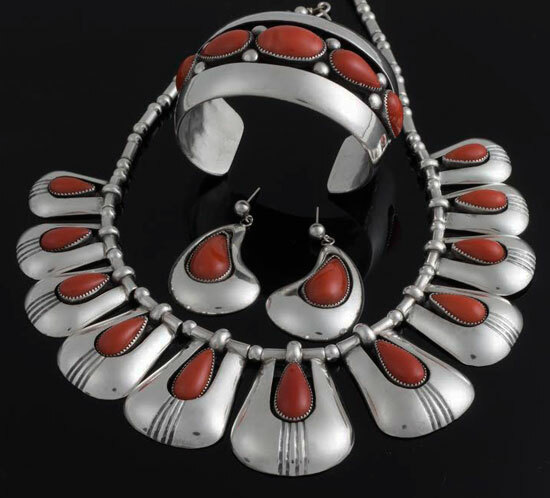 These pieces designed by Frank Sr. epitomize the Patania Thunderbird style. 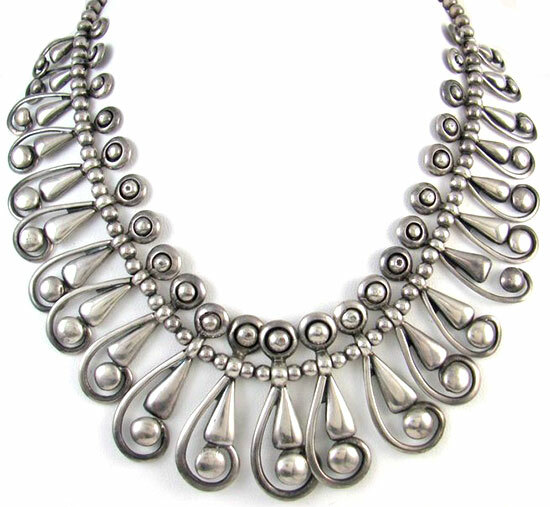 A Frank Sr. necklace with a repeated scroll motif, circa 1950s. 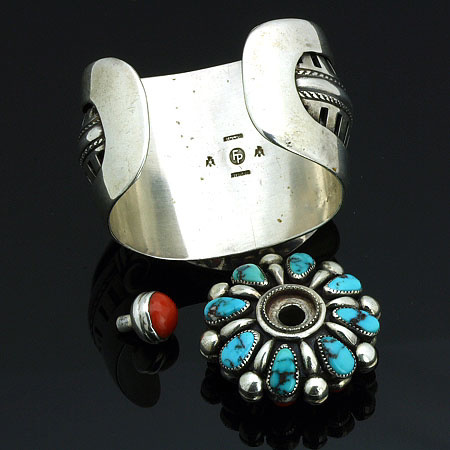 A silver, coral, and turquoise bracelet by Frank Sr., circa 1950s. The same cuff shown with its reversible central pendant unscrewed. 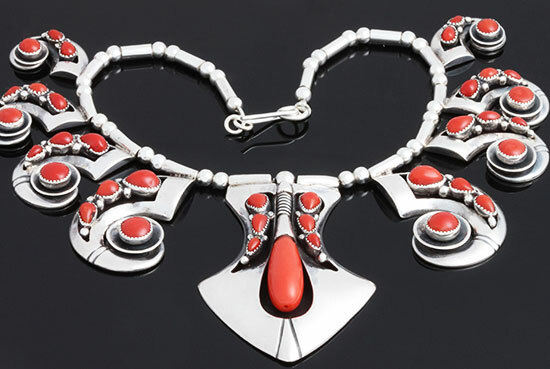 A sterling silver and coral parure by Frank Sr., circa 1950s. An iconic scroll necklace by Frank Sr., circa 1955. 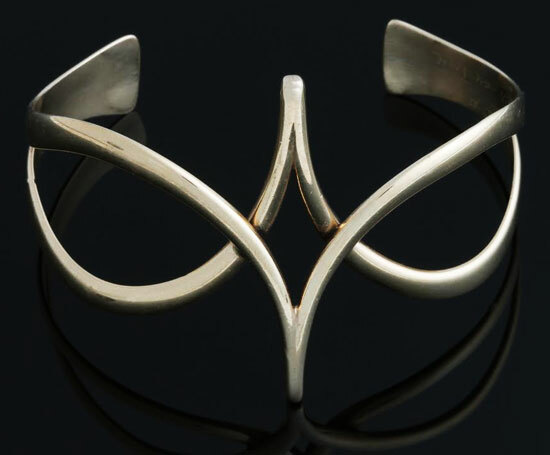 Frank Patania Jr.'s Asymmetry or Twin Peaks bracelet, circa 1950, is now in the Smithsonian collection. This layered bracelet by Frank Jr. exhibits his architectural style, circa 1960. 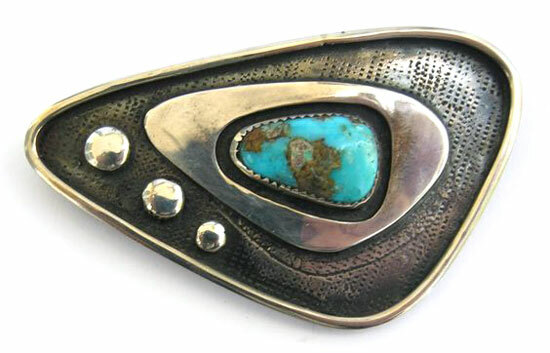 A modernist brooch by Frank Jr., circa 1970. 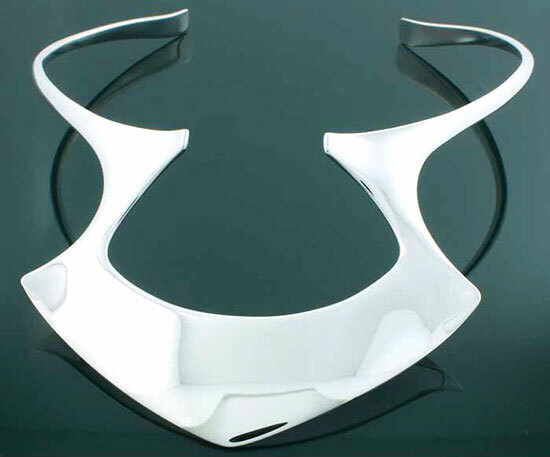 A necklace designed by Frank Jr., circa 1970s. 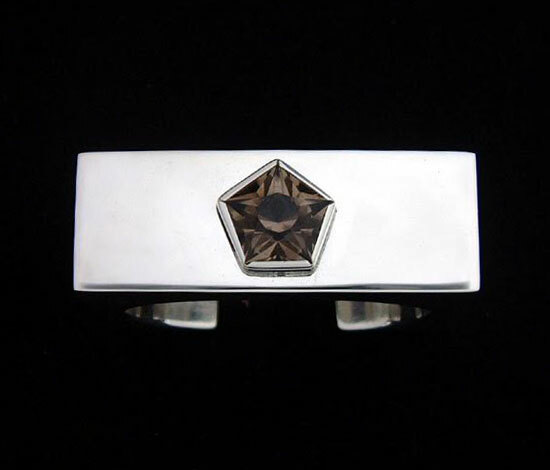 A minimalist bracelet of sterling silver and star-cut topaz by Frank Jr., circa early 1970s. 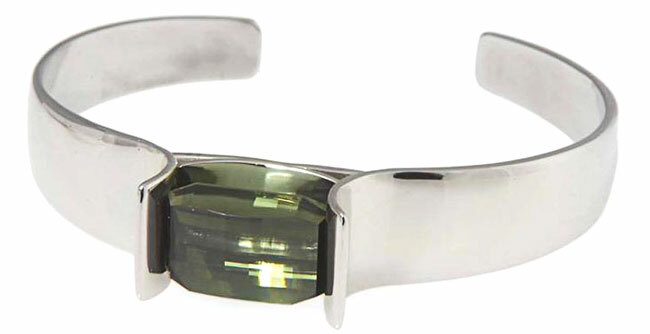 Sterling silver bracelet by Frank Jr., circa 1975. These Cathedral rings, originally designed by Frank Jr., were cast and finished by Sam Patania. 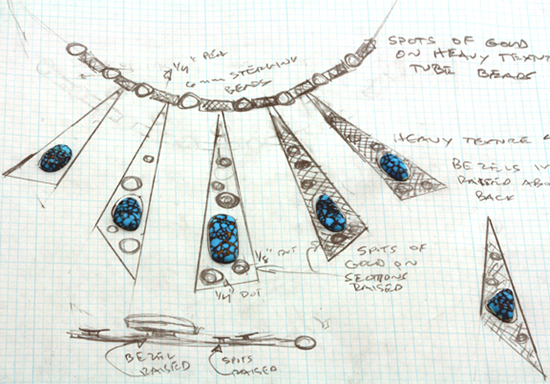 A necklace design sketched by Sam Patania incorporates pieces of vintage turquoise. 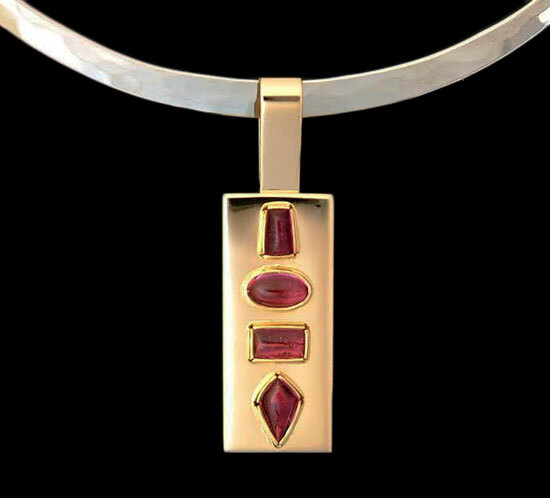 A geometric gold and tourmaline pendant designed by Sam Patania, circa 1990s. 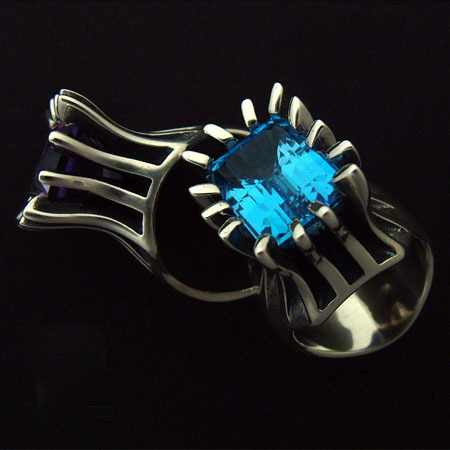 A contemporary bracelet by Sam Patania, circa early 2000s. 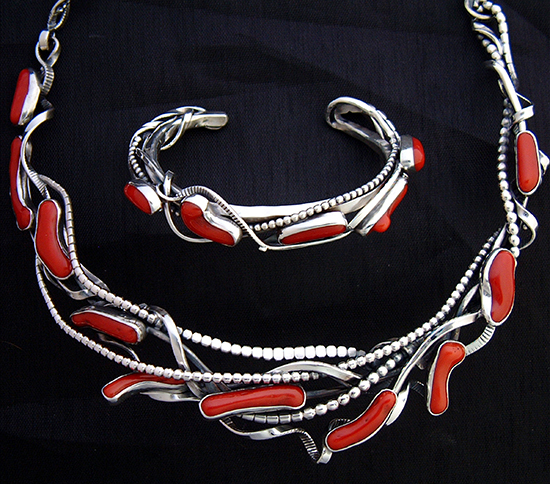 A Coral Reef set by Sam Patania, circa 2010. 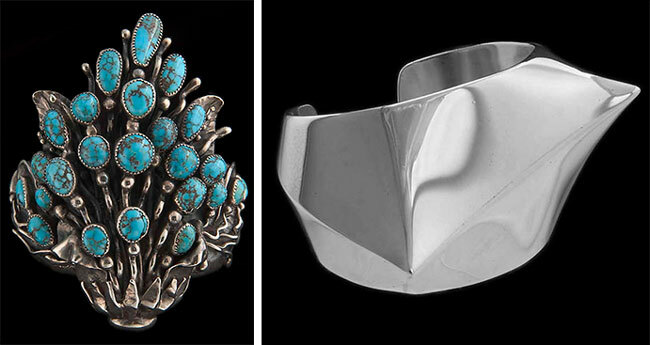 When picturing jewelry of the American Southwest, it’s easy to conjure a cliché of silver-and-turquoise bolo ties and squash-blossom necklaces. But it’s unlikely this fantasy includes the work of the Patanias, a family of Italian-American entrepreneurs who helped make the region famous for its bold jewelry. Since the 1920s, when first-generation immigrant Frank Patania arrived with his old-world techniques and adapted them to local tastes and materials, the Patania family has been an influential force in the area’s creative community. 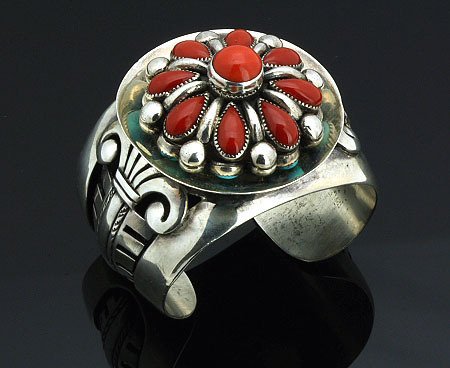 Frank opened his original Thunderbird Shop in Santa Fe, New Mexico, just as outside interest in the area began to spread, and the Patanias would eventually achieve broad recognition for their distinctive wearable art—work that was inspired by Native American jewelry but executed by the hands of a traditional Italian goldsmith. 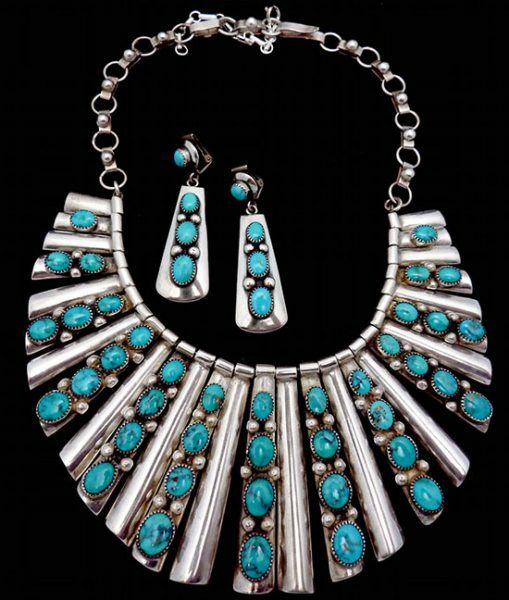 Following in the footsteps of their patriarch, three subsequent generations of the Patania family have created striking jewelry influenced by a blend of European and Native American traditions. Their work has been beloved by celebrities and recognized by the Smithsonian, with Frank Sr., his son Frank Jr., and his grandson Sam Patania each represented in the collection of the Renwick Gallery at the Smithsonian American Art Museum. Today, Sam and his son, Marco, continue the family legacy at their shop, Patania Sterling Silver Originals, in Tucson, Arizona. Although Frank Sr. passed away when Sam was still a child, some of his innovative designs live on, now formed by the hands of his grandson. Born in 1899, Frank Patania, Sr., began apprenticing in the goldsmithing trade in Sicily around the age of 6. When his hometown of Messina was hit by a major earthquake in 1908, the Italian government helped Frank’s family emigrate to the United States, where they settled in New York City. After waiting a few years to reach the legal working age of 14, Frank took a job with an upholsterer making tassels for furniture, though he soon moved into the jewelry business he was originally trained for. Above: Left, the Floral Spray bracelet by Frank Sr., circa 1950, and the Asymmetry bracelet by Frank Jr., circa 1960, are both in Smithsonian collection. Via the Smithsonian American Art Museum. 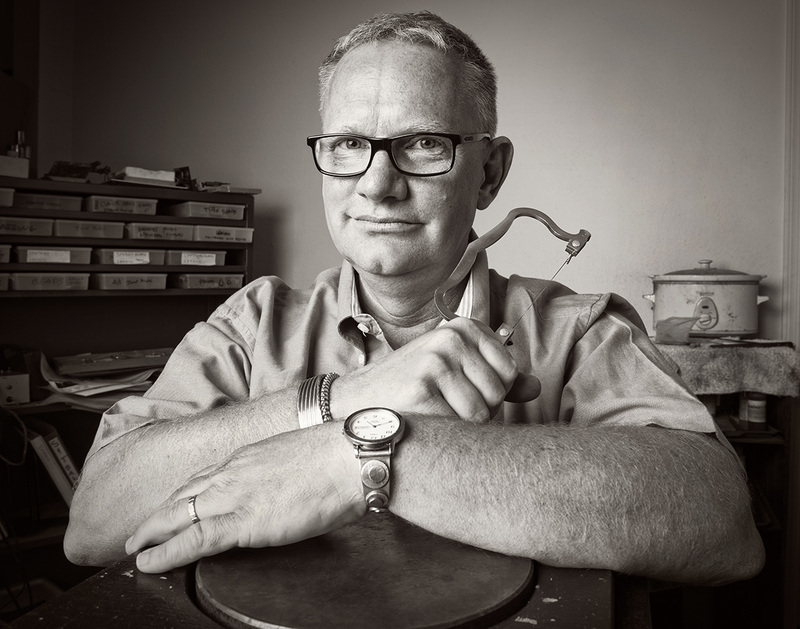 “Frank Sr. started at a jewelry company named Goldsmith, Stern & Company in Manhattan where he was recognized as a designer while still in his teens and early 20s,” Sam Patania explains. 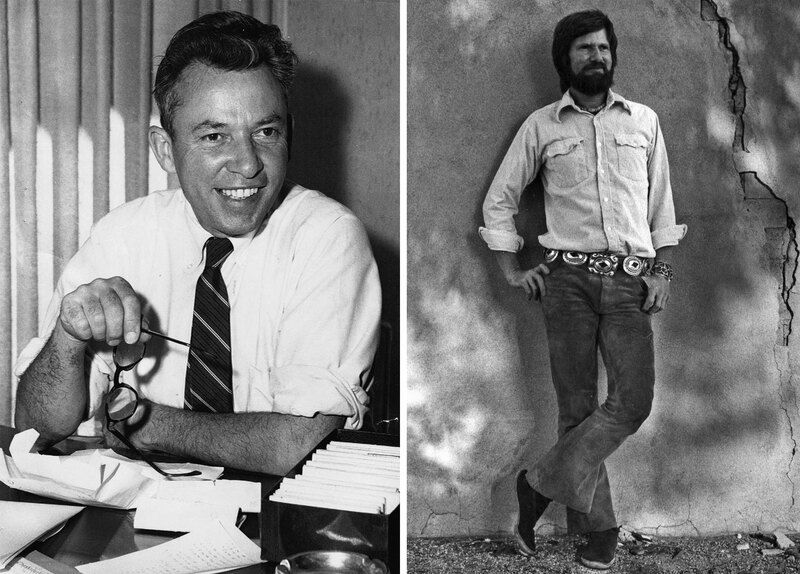 “He was a beloved employee.” After Frank Sr. was diagnosed with tuberculosis, the company’s owner sent him to Santa Fe to recover, and he soon fell in love with the high-desert region. Following a stint working for Julius Gans’ Native American jewelry and craft store, Frank Sr. opened his first business, the Thunderbird Shop, next to the Santa Fe Railway ticket office on the town’s famous plaza in 1927. In addition to Patania’s original jewelry designs, the store also featured artwork and crafts by Native Americans as well as imported products from Italy and other countries. 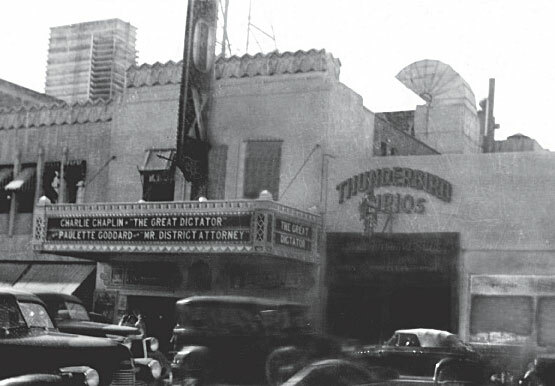 The Thunderbird Curios Shop in Tucson, seen to the right of the Fox Theater marquee, opened in 1937. As Patania explains, Frank Sr. was the sole designer for the Thunderbird Shop, though he employed several craftsmen to produce jewelry at his workshops in Santa Fe and Tucson, often hiring Native American jewelers. 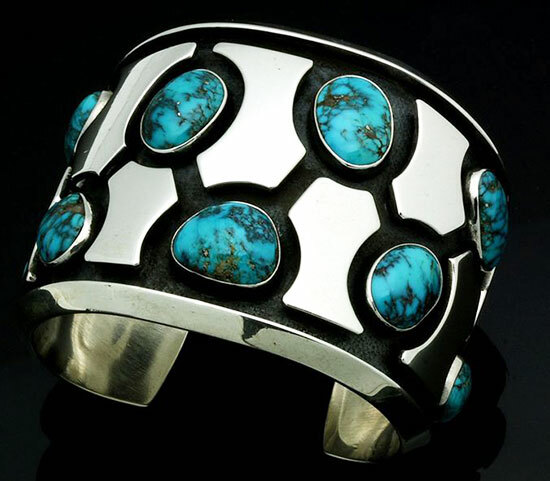 Many eventually became established artists in their own right, including Julian Lovato of the Santo Domingo pueblo in New Mexico; Arthur and Andy Rivera, who owned a shop across from the La Fonda Hotel in Santa Fe; and Alberto Contreras in Tucson. Frank Sr., left, circa 1950s and Frank Jr., right, circa 1960s. 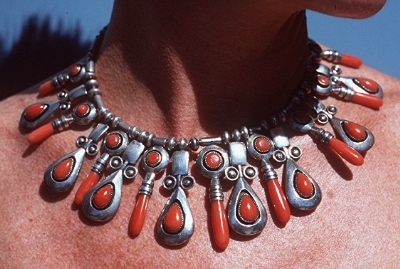 A coral and silver necklace by Frank Sr. from around 1955. The Thunderbird Shop also benefited from the expansion of Fred Harvey’s tourist company, which brought thousands of outsiders to the region, many looking for “authentic” souvenirs. Frank Sr. made jewelry for some of the company’s famous Harvey Girls as well as members of the Santa Fe creative community, including Mable Dodge Luhan and Georgia O’Keeffe. “His designs weren’t so regional, meaning his work could be worn with a wonderful fashionable impact in Manhattan, Chicago, or Kansas City,” Patania says. The Original Thunderbird Shop’s letterhead, circa 1930s. 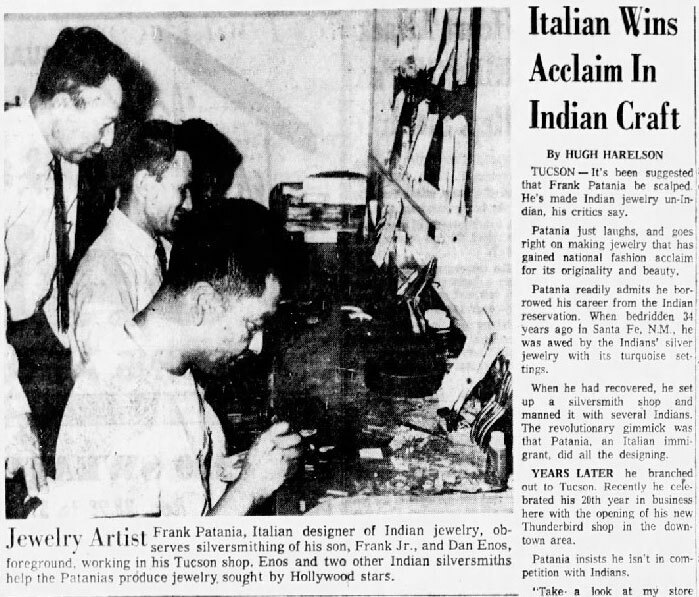 This 1958 article showed Frank Sr. in the workshop with his son and other jewelry craftsmen. By this time, Frank Sr. was able to afford more employees, machinery, and fine materials, like coral procured in his native Italy. He worked like a traditional studio master, where his most trusted craftsmen would make parts that he would assemble into a final piece. “There was simply more money and larger market for damn near everything during the 1950s,” Patania says. Around the same time, his son, Frank Patania, Jr., returned to the family jewelry business after completing college and his service in the U.S. military. Frank Jr. quickly developed his own aesthetic, which was influenced by the simpler geometric forms of Mid-Century Modern design. 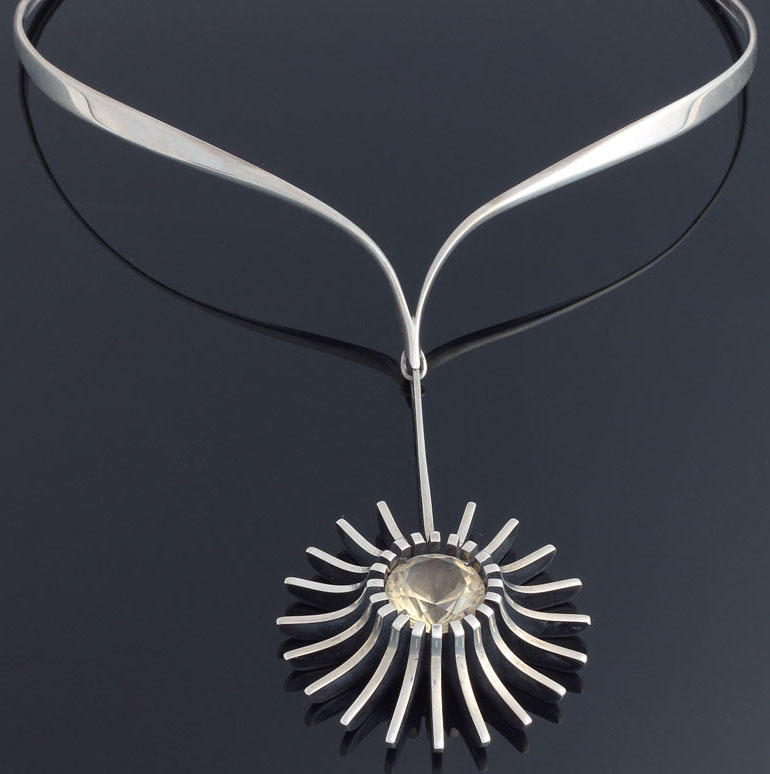 The Star necklace by Frank Jr. was made from sterling silver and citrine, circa 1960. “My dad distinguished himself by creating what he calls his ‘architectural style,’ which was influenced by architecture he had seen,” Patania explains. “He was a journeyman silversmith by the time he was in high school, meaning he had completed his apprenticeship with a master, so he had a big advantage in being able to sit down and work without worrying about technique. But like many artists, he pushed himself beyond what he was comfortable with and went into areas he wasn’t trained for.” Frank Jr.’s time at the University of Arizona had opened his eyes to a range of arts and media far beyond his jewelry apprenticeship, and his more contemporary designs were soon winning awards and achieving recognition in exhibitions on modernist jewelry. 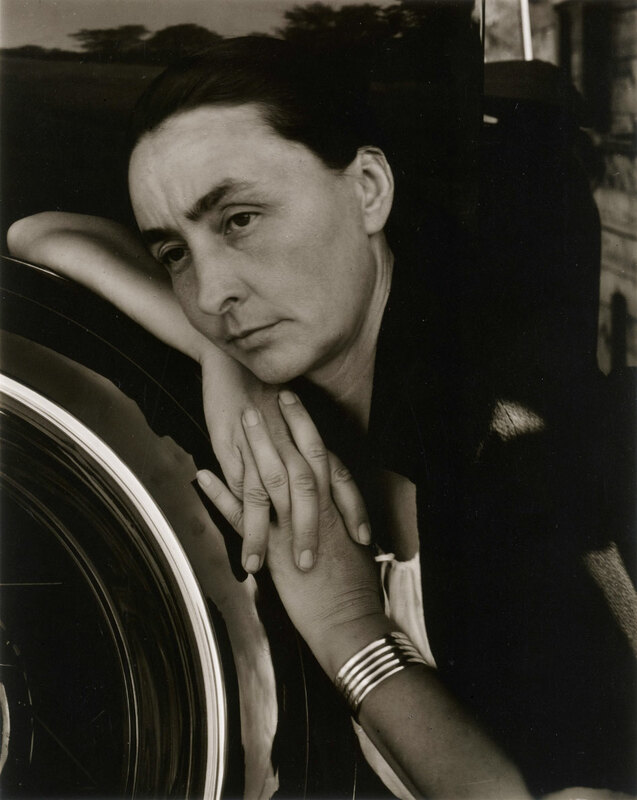 Georgia O’Keeffe wears a bracelet designed by Frank Patania, Sr., in this 1933 photo by Alfred Stieglitz. Via the Metropolitan Museum of Art. Today, Patania has integrated new technologies into the family business that shorten the time to produce jewelry and increase output, while still allowing for pieces to be finished by hand. 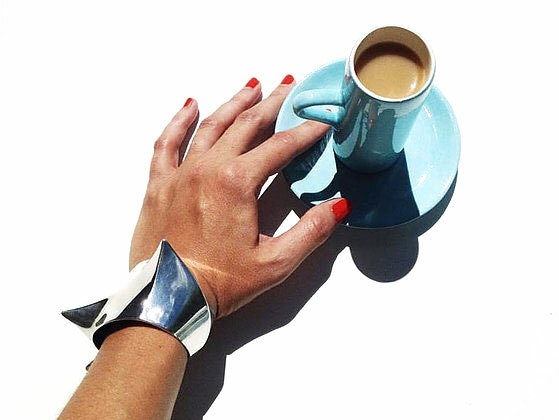 “Starting in the late 1990s with the advent of hydraulic presses for jewelry, the use of urethane—for either the punch or the die—changed everything,” Patania says. “Now, these can be made easily and cheaply out of Delrin or Plexiglass with the opposing punch or die being made of urethane, which takes whatever shape it’s pushed into. By using urethane, the amount of handwork required to finish a piece is much reduced because urethane leaves little or no tool marks.” Along with the help of his son, Marco, Patania uses the hydraulic press to make as much jewelry as a room full of craftsmen, without sacrificing quality. 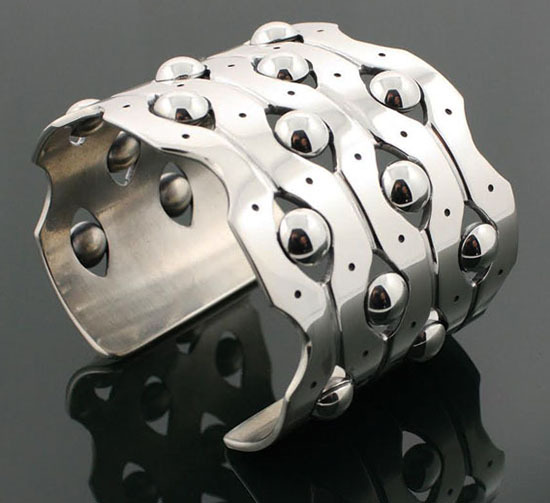 Sam Patania’s Tension bracelet, from 1999, was acquired by the Smithsonian. Via the Smithsonian American Art Museum. In 1999, the Patanias’ work was showcased in a three-generation show at the Tucson Museum of Art and the curator in charge, Joanne Stuhr, brought their work to the attention of a curator at the Renwick Gallery of the Smithsonian Institute, Kenneth Trapp. Trapp thought it was important enough to include in the Smithsonian’s permanent collection, so pieces by Frank Sr., Frank Jr., and Sam Patania were all acquired. Sam Patania in his studio. “ ” The banjo in postwar America was perceived primarily as a white, rural instrument.